Spring in Michigan means getting outdoors and exploring the more than 36,000 miles of rivers and streams and 11,000-plus lakes (more than Minnesota, the “Land of 10,000 lakes), supporting the state’s $2.4 million fishing industry (retail sales). 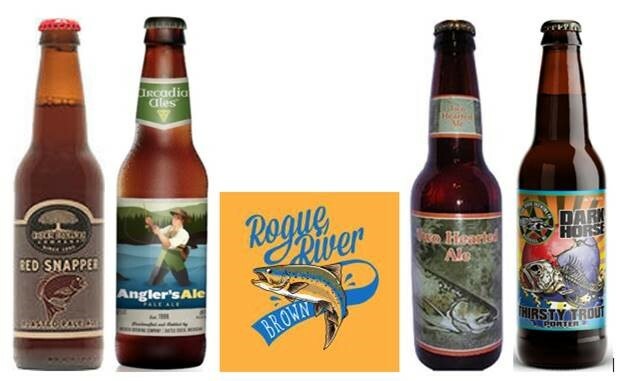 It’s also the perfect time to enjoy one of these fishing-inspired Michigan craft beers! Arbor Brewing: Red Snapper (5% ABV | 41 IBUs). A deep reddish brew with medium body and carbonation. This toasty, malty, and dry pale ale has a depth of hop taste and roasty notes in the palate and finish and blends the rich malty character of an Amber Ale, the crisp hops of an American Pale Ale, and the roasty, nutty flavors of an English Brown. Pairs like an American Pale ale and a dry Irish Stout. Great with cured meats, battered pan-fried fish, ham, and roast beef au jus. Arcadia Ales: Angler’s Ale (5.4%ABV | 34 IBUs). It is medium-bodied, crisp and well-balanced with a flavor profile featuring subtle notes of caramel, toffee and toasted malt, counterbalanced by the ideal level of hop bitterness. The strikingly authentic English-style pale ale is brewed with all-English malts and a pound-and-a-half of Pacific Northwest hops per barrel. It is medium-bodied, crisp and well-balanced with a flavor profile featuring subtle notes of caramel, toffee and toasted malt, counterbalanced by the ideal level of hop bitterness. The delicate herbal hop finish is produced by Goldings whole leaf hops. Pairs with buffalo burger, pizza, club sandwiches, fried chicken, aged sharp cheddar and roast beef with Vidalia onions. Bell’s Brewery: Two Hearted Ale (7% ABV | 55 IBUs). This is a 100% Centennial hop IPA, with grapefruit and pine aromas, and a solid malt balance. Bursting with hop aromas ranging from pine resins to grapefruit notes, this remains one of the defining American-style India Pale Ales – named after the 23.6 mile Two Hearted River in Michigan’s Upper Peninsula. Pair Two Hearted with bright-flavored dishes that contain citrus or cilantro, spices like coriander and cumin, or strong spicy dishes. Curry is a must. Great with ground beef tacos but also ceviche or bacon wrapped frog legs. For dessert, pair with carrot cake, caramel apple tart, ginger spice cake or persimmon rice pudding. Also pairs well with cheeses like aged Mammoth cheddar, EMMI Le Gruyere, Blue Costello, Cambanzola, Gorgonzola, 3-year-old Grafton, Trader Joe’s Goat Milk Brie (with the rind) or Cotswold with herbs. Dark Horse: Thirsty Trout Porter (7% ABV | 23 IBUs). This porter pours dark brown, nearly black, with a nice off white head. The aroma is very rich in roasted chocolate malts and coffee beans. Lots of caramel with a mild sugary sweetness. The flavor starts very strong on the chocolate malt side, but mellows out in the middle with some nuttiness and fruit notes, finishing with floral hops. This beer pairs well with roasted, smoked and barbecued foods, including beef, poultry, seafood, sausage, chili and hearty stews. It also would go well with pretty much any rich dessert, from cheesecake to brownies. Rockford Brewing: Rogue River Brown (6.5% ABV | 30 IBUs). This well-balanced, malt forward nutty brown ale is named for the brown trout in the Rogue River, which runs through Rockford. Munich, biscuit, chocolate and caramel malts are used to create a warm complexity. The rich malty front will finish slightly dry with a mellow earthiness from Willamette hops. This incredibly-diverse beer pairs well with an array of foods, as well as making it a great beer to cook with. It is great in chili and stew, or as a glaze and in balsamic dressings. Pair it with grilled red meats, like a simple burger or a rare grilled steak with some charred grill marks on the surface to pull out the roasted notes in the beer, or grilled seasonal vegetables. Nutty cheeses, like an aged gouda or Swiss, or sweets like sea salt caramels, pecan pie or chocolates, also will pair well with this brown brew. Michigan’s angler participation rated fifth in the nation — 1.4 million licensed resident anglers and 347,000 non-resident anglers in 2011 – drawing over $11.2 million in federal funds to fish and aquatic habitat conservation. These anglers fished nearly 28 million days and contributed an overall annual value of sport fishing to Michigan’s economy estimated at $4.2 billion. Michigan boasts 153 species of fish, the most diverse and highest-quality of freshwater fishery in the United States. Trout Unlimited was founded along the banks of the AuSable River, near Grayling, in 1959. There are more than 500 charter fishing businesses that operate on the Great Lakes, and 300 inland river guides. Michigan offers an award-winning “Catch & Cook” program which allows the public to take a licensed charter and then take their catch to an approved restaurant to be prepared for their own meal that same day.